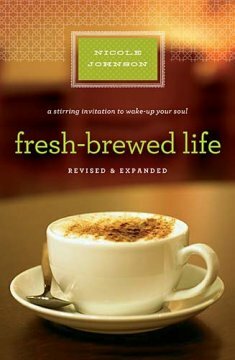 “The Fresh Brewed Life” is an intimate reflection in the life of a person searching for hope, peace, meaning, answers etc. It has taken me many months to complete “The Fresh Brewed Life” because the book forces the reader to open up and expose yourself to you. It isn’t about self-help, but about learning how to actually seek God for help. Nicole Johnson shares her personal stories that make you want to pause and think, reevaluate and then move forward. In my own life’s journey when I started reading the book, my desire was to coast along and read a happy devotional. The book is so much more than morning breakfast chats, it is like Nicole gives people a opportunity to sit and open pages to her journal. Nicole’s vulnerabilities and thoughts from within are placed in the book. She allows the reader to partake of lessons she has learned in her life on a breakfast platter and serves them to the reader. I feel honored she trusted me, the reader, with so much and I thank her sincerely, for opening up her life so I would start contemplating the details of my own personal journey. I was eager to read this book because I had the opportunity to meet Nicole Johnson last year at the Women of Faith’s Imagine Conference. Seeing her monologue in person was inspiring. She definitely has a knack for being transparent and sharing her authentic voice with the world. Her courage intrigues me, deeply. As a Christian, I believe she edifies how the Christian walk is suppose to be: hopeful, reflective, and dependent on God. Therefore, if you are interesting in a happy-go-lucky easy reader this may not the book for you. If you want to get to know your inner-self without judgement through the experience of another person who is sorting things out, then pick up “The Fresh Brewed Life” and drink in fullness of starting a path towards restoration and beginning a new journey along the pathway of self-reflection, journaling, self-confidence, and seeking a personal relationship with God.